If you are about to move out of your rented property and want to have it cleaned thoroughly, use our excellent end of tenancy cleaning services. They are done by qualified and skilled cleaners who will make sure you receive your rental deposit. Our services can be used by lodgers, property owners and letting agents. The cleaners in our company will make your rented property flawless, hygienic and ready to be rented again. Call us or use our booking form to order the end of tenancy cleaning which we provide in Earls Court. The cleaners in our company will sanitize every room in the flat or house. They use modern cleaning machines and harmless for the health detergents. Our employees focus on the more frequently used areas and rooms which tend to get more soiled. They will implement professional and thorough disinfecting of the bathroom and toilet, as well as well sanitizing of the kitchen and hallway. The cleaning will be started and finished in the previously planned time and ensure you the receiving of your security deposits. Get in touch with our company, located in Earls Court to order the end of tenancy cleaning which you need. The cleaning personnel in our company will make your rented flat or commercial property spotless and hygienic. They will remove the dust, cob-webs, grease, stains and dirt from every room in the flat which you plan to vacate. Our cleaners use the most efficient detergents, cleaning solutions and modern machines to speed up and facilitate their work. Rely on them to prepare your estate for renting out by cleaning it thoroughly and fast. 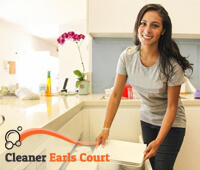 Our end of tenancy cleaning services are provided in and around Earls Court seven days in the week.